Jesse James. Cole Younger. Billy the Kid. Bonnie and Clyde. All were criminals who robbed and murdered their way into history thanks to being turned into distorted Robin Hoods by dime store novels, bleeding newspaper headlines, and eventually a variety of movies. The supposed glory days of stickup artists arguably ended by the time the 1940s rolled around, yet one man named Forrest Tucker (1920-2004), who had a flair for the dramatic, probably stole more than all the aforementioned bandits combined. 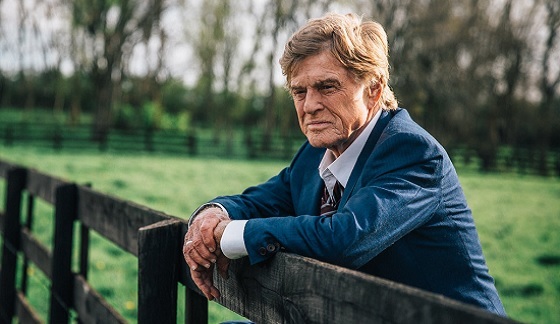 His life of crime, which began at the age of 15, is detailed in the current drama “The Old Man and the Gun,” starring Robert Redford in the alleged last acting gig of his career. Redford goes out with a bang in a performance that is charming and engrossing. Written and directed by David Lowery (“Pete’s Dragon,” “Ain’t Them Bodies Saints”), “The Old Man and the Gun” is based upon a January 27, 2003 article of the same name in “The New Yorker” by American journalist David Grann. Like the title implies, we meet Tucker in his older years when he should be enjoying retirement somewhere sunny or at the very least staying out of trouble with the law. However, we quickly discover that Tucker cannot give up the thing he loves the most no matter what his age is. With fellow thieves Teddy (Danny Glover) and Waller (Tom Waits) in tow as part of what the press dubs the Over the Hill Gang, Tucker continues a nationwide bank heist spree in 1981 that garners the attention of detective and family man John Hunt (Casey Affleck). Hunt and Tucker are complete opposites of each other, but there is a bit of mutual respect as a cat-and-mouse game evolves before Hunt’s case is taken over by the feds. In the middle of it all, Tucker encounters Jewel (Sissy Spacek), a single woman with a small horse farm in the country. He beguiles her with his charm, which Redford fleshes out effortlessly in scenes not only with Spacek, but also in scenes when Tucker is holding up banks with smiles and courtesy. Their chemistry on the silver screen is tangible and watching these two acting masters at work is a special cinematic treat to be savored like a fine wine. Of course, their relationship becomes more complicated when she discovers his real line of work, which is growing increasingly perilous as he continues to take chances despite mounting press coverage of his crimes. Lowery has crafted a wonderful little film that flows smoothly from beginning to end with great acting and solid dialogue. Waits is subtly fantastic as a hardened tough guy while Glover quietly plays a worrywart and Affleck is solid in a nice supporting role. Beneath the entertaining Hollywood veneer, though, is a man who was in and out of jail his entire life, which included 18 alleged successful escapes from various detention centers and prisons. The film glides by how many lives were adversely affected by Tucker’s criminal activities and it only gives a brief nod to what happened to his family. Much like the dime store novels of the 19th century, “The Old Man and The Gun” sentimentalizes Tucker by taking a lot of dramatic license with reality. So much so that Tucker achieves a certain level of sympathetic status that whitewashes the fact he was a habitual criminal. “End of a Gun” is the latest direct-to-Blu-ray dump from Steven Seagal. I can’t believe how many cheap action movies, this guy puts out every year. I swear that this is the 4th or 5th one just in 2016. Not sure how he does it but the guy keeps busy. Not the worst little action film. Low budget, nothing special but I do have a soft spot for Mr. Seagal. Keep them coming man! Official Premise: An ex-DEA agent’s life takes an unexpected turn when he comes to the rescue of a seductive woman and finds himself entangled in a bloody game of cat and mouse with a maniacal drug lord after going on the run with her…and $2 million worth of drug money. Lionsgate is releasing this Blu-ray with a Digital HD copy included of the film. And if you are looking for any other special features, there are none. Nothing at all, which is not surprising due to the quality of the film itself. Seems like a “we don’t care just throw Seagal on the cover and it will sell” attitude here. 3D Blu-ray Review "Top Gun 3D"
Who doesn’t love “Top Gun”? This film is easily one of the best things to have come out of the 1980’s and has Tom Cruise at his prime. I think I must listen to Kenny Loggins’ “Danger Zone” at least once a week. So what is new about this release of “Top Gun”, well most importantly it has been converted into the third dimension and boy is it impressive. Paramount did a really sharp job in restoring and releasing this film in 3D. It is a very solid 3D presentation without any cheap gimmicks. Of course when this film hits the skies is where the 3D really gets a chance to spread its wings. The aerial scenes are truly amazing and delivers the best added depth. The adding of the 3D just seems natural and like it was meant to be seen like this. If you are a fan, I mean who isn’t?, of this 80’s classic then this is a great way to enjoy the film again for the first time in its new format. Paramount has delivered an impressive release within this two-disc Blu-ray. Besides the 3D Blu-ray, it also including the previously released 2D disc as well and an Ultraviolet digital copy as well. This 1080p transfer is newly re-mastered and comes with the highest quality image that “Top Gun” has ever been attributed to. This release carries over the same audio options as the last Blu-ray release, which are still amazing! There are two tracks a DTS-HD MA 6.1 and Dolby TrueHD 5.1 track. They are both impressive but the 6.1 track really shines the most. Once the film takes off any Loggins’ “Danger Zone” starts playing, I got the chills and blasted the volume to 11! Let me tell you how amazing it sounded. Of course that is not the only great song in this film including the classics Berlin’s “Take My Breath Away” and very funny “Lost That Lovin’ Feeling”. Besides just songs the aerial battles are great and have you ducking as they fly by your speakers. The special features are taken from the previous releases but are still very impressive. First off we have a solid audio commentary track including producer Jerry Bruckheimer, director Tony Scott, co-screenwriter Jack Epps, Jr. and naval experts. This track contains information overload and really delivers. Must listen! “Danger Zone: The Making of ‘Top Gun” is a fantastic super in-depth 2.5 hour six-part documentary. If you love “Top Gun” then this is the special feature for you. “Multi-Angle Storyboards” focuses on two sequences, “Flat Spin” and “Jester’s Dead”, from the film with optional commentary by Tony Scott. This is cool but multi-angles extras feel a little too DVD for me. “Best of the Best: Inside the Real Top Gun” is another fantastic documentary is a look into the real-life history behind this film. Next up have two decent featurettes, the first focusing on “Behind-the-Scenes”, which is clips mixed with interviews on the production. “Survival Training” looks into what the cast has to go through to get prepared for their roles. There is a nice interview with Tom Cruise chatting about the role and the film. Of course I go back to the great music in this film. There are four music videos including Kenny Loggins’ Danger Zone, Berlin’s Oscar-winning “Take My Breath Away”, Loverboy’s “Heaven In Your Eyes” and of course, the Top Gun Anthem with Harold Faltermeyer and Steve Stevens. Lastly there are also seven vintage television spots wrapping up these great extras. In a career spanning six decades, James Tolkan has conquered every medium he’s ever attempted. While pursuing a career in music at college he auditioned for a school play on the advice of a friend who suggested performing in front of an audience would help him with his stage fright. Tolkan was cast in the lead and he hasn’t looked back. Though best known for his work in “Top Gun” and the “Back to the Future” trilogy, I knew him best for his theatre work. In 1984 Mr. Tolkan originated the role of quick-tempered real estate salesman Dave Moss in the Pulitzer Prize winning drama “Glengarry Glen Ross,” a role I myself played many years later. While preparing for his appearance at this weekend’s Con X Kansas City Convention Mr. Tolkan spoke to Media Mikes about Broadway, “Back to the Future” and his memories of directors Tony Scott and Sidney Lumet. Mike Smith: I guess I’ll start with the standard first question: what led you to become an actor? James Tolkan: Oh my gosh! It’s a really complicated answer. When I got out of the Navy I was totally lost. I went back to college where I majored in art and minored in music. I was studying singing. I was very nervous getting up in front of an audience so a friend of mine suggested I try out for a play so I could get used to being in front of an audience. So I tried out for a play and was cast in the lead. I was like, “hey, this is interesting.” So I did another play at the community theater and suddenly I became very interested in acting. I then went to the University of Iowa, which had a large theater department and it was there that I was “encouraged” to go to New York and study the Method with some of the great teachers. So in 1956 I got on a Greyhound bus in Iowa City with $75 in my pocket and I went to New York to become an actor. I didn’t know what I was getting into…I was a total hick. I got off the bus and I was scared to death. I went through all kinds of various jobs while I studied with Stella Adler. After the first year she gave me a full scholarship to study with her. And then I started working. The first play I auditioned for off-Broadway I was cast. A lot of casting people saw me and I started going from one play to another. I also wanted to study with Lee Strasberg, which I did for three years. Both teachers were very valuable…but very different. It’s been a great experience. I’m really just a New York actor. I’m a stage actor. And I said I was never going to Hollywood until Hollywood sends for me. And in 1984, while doing the David Mamet play, “Glengarry Glen Ross,” on Broadway, Robert Zemeckis called me and asked me to be in “Back to the Future.” Of course nob ody knew who Robert Zemeckis was back then but I said “ok” because this was my chance to go to Hollywood. So after a year on Broadway I went to Hollywood and did the movie. I stayed in California and did some television series. Then I did “Top Gun” and all of a sudden I’m a Hollywood actor! It’s been a wonderful odyssey and I’ve survived it all! MS: You started your career in what is now referred to as the “golden age” of television. In your opinion, what’s the biggest difference in the way television shows are produced today versus then? JT: Well, at that time, a lot of television was done live. It was live television. You go on and you do it and that’s it! Today everything is much more safe. The three camera comedies. You have a live audience and a controlled condition. And the writing is very different. The writers today are very bright and very…demanding. They don’t always know how to use actors. MS: You understudied Robert Duvall in a couple of Broadway shows, including “Wait Until Dark.” Did you ever get to play “Wait Until Dark” villain Harry Roat on stage? JT: I took over the role of the Longshoreman in Arthur Miller’s “A View From the Bridge” from Robert Duvall on Broadway and played that part for many months. Then “Wait Until Dark” opened with Lee Remick. Two weeks into the run I get to the theater and there’s no Robert Duvall. The director tells me Duvall broke his hip riding horseback and I was on. I was ready and I went on and I played that part for two years. I played it for a year on Broadway with Lee Remick then I played it with Shirley Jones on a tour and then later with Barbara Bel Geddes. And the character was so dark. Believe me it was hard on one’s psyche to do that. MS: I’m so glad you mentioned “Glengarry Glen Ross.” You originated the role of Moss on Broadway and I’ve actually played Moss in a production here in Kansas City. JT: Really? Good for you. Isn’t that just a fantastic play? It was a great experience in my life. To work with David Mamet. We previewed in Chicago and it was a big hit there. Then we took it to New York where it was a huge hit. It was one of those shows where you know you held the audience the whole night in the palm of your hands. It’s getting ready to go back to Broadway this year with Al Pacino playing Shelly “The Machine” Levine. MS: Really? Pacino was a great Ricky Roma in the movie. Of course he’s older now. JT: Before the movie was made Sidney Lumet had the rights to the show and he called all of us to come in and have a reading up at his office. At the time Sidney wanted Pacino to play Shelly but Al insisted on playing Roma. The project fell through and the production ended up in someone else’s hands and Al got to play Roma. MS: Which leads me to my next question. You were obviously a favorite of Sidney Lumet, having worked with him several times. As a director yourself did you pick up any tips from watching him work? JT: If you want to learn about how to approach actors and acting on a film, work with Sidney Lumet! Of course it’s a little late now but he was so special…so wonderful. He made you feel like THIS is why you want to be an actor. He was just amazing. With most movies in Hollywood you get together just before you start shooting and sometimes it’s 20 takes…50 takes…whatever until everyone is comfortable with the scene. With Sidney it was three weeks of rehearsal. The first week you just sat around the table. He’d say, “OK, no acting…just talk.” It’s very simple. We’re just trying to relate and connect with each other. The second week we’d start getting up on our seats and playing the various scenes. The third week we’d run through the script in sequence like it’s a play and he’d would go off with the cinematographer setting up all of the shots. So when we got on the set everybody knew their job. You’d start shooting and he’d get everything in one or two takes. You were going home every day at four o’clock. It was like working with a master. He was just a wonderful, warm and brilliant person. MS: Tony Scott, who directed you in “Top Gun,” recently passed away. Do you have any memories of him to share? JT: He was such a regular guy…rough and ready. He was always smoking a cigar. He was a mountain climber and he rode motorcycles. He was quite different from Sidney Lumet but a very good man to work with. Sometimes he’d want to do a scene that wasn’t scheduled and I’d tell him I wasn’t ready and he’d just smile and say, “you can do it, James” and we’d get it done. He was very off the cuff and non-chalant. But at the same time intense, if that makes sense. I’m still stunned about how he passed. Why he would make that kind of choice is totally a mystery. MS: Originally “Back to the Future” ended with the words THE END. Only when it was released on home video did the words TO BE CONTINUED appear. Were you aware while you were filming that there were three films planned? JT: Oh no. The first film was a very small movie. Steven Spielberg at the time was more interested in another movie he was producing called “Goonies.” This was something that was really on the back burner. Nobody knew who Robert Zemeckis was. We were working for not a lot of money and had really tiny dressing rooms. Then that movie opened and it was an amazing success! Like they say, all of the planets had to have been aligned for that movie to be so successful. And right after that they said they were going to do a part two and part three. But when we finished filming part one there was no talk whatsoever of the sequels. MS: Were you able to do any scenes with Eric Stoltz? MS: Are you working on anything now? JT: No, I’m pretty much retired. I did do an HBO movie over the summer with Al Pacino and Helen Mirren about the trial of record producer Phil Spector. I play the judge. Again, it’s a David Mamet script which he also directed. He called me up and cast me. If someone calls me, I’ll do it. But right now I’m enjoying my life. (Beverly Hills, Calif.) September 14, 2011– Relativity Media is proud to announce it is working with eBay to auction off premiere tickets, an autographed movie poster, and a custom-built motorcycle from its upcoming release of Machine Gun Preacher. Gerard Butler (300) delivers a searing performance as Sam Childers, the impassioned founder of the Angels of East Africa rescue organization in Golden Globe-nominated director Marc Forster’s (Monster’s Ball) moving story of violence and redemption. All proceeds will benefit Childers’ charity. The online charity auction http://www.ebay.com/machinegunpreacher goes live on Wednesday, September 14 when bidding opens for two VIP seats to the Los Angeles Premiere and an autographed movie poster signed by the cast, and closes on Monday, September 19. The premiere tickets’ starting bid is $500, while the starting bid for the autographed poster is $50. Bidding will begin on Monday, September 26 for the 2010 custom-built Rate Bike motorcycle, ridden by Gerard Butler in the movie, through Thursday, October 6. The starting bid is $30,000. The winning bids are 100% tax deductible. Machine Gun Preacher is the inspirational true story of Childers (Butler), a former drug-dealing criminal who undergoes an astonishing transformation and finds an unexpected calling as the savior of hundreds of kidnapped and orphaned children in East Africa. The explosive, real-life tale of a man who has rescued over a thousand orphans from starvation, disease, and enslavement, Machine Gun Preacher is written by Jason Keller (Relativity’s Untitled Snow White) and also stars Michelle Monaghan (Source Code), Kathy Baker (Cold Mountain), Madeline Carroll (Mr. Popper’s Penguins), Academy Award® nominated Michael Shannon (Revolutionary Road), and Souleymane Sy Savane (Damages). Producing are Forster, along with Relativity’s Robbie Brenner, Safady Entertainment’s Gary Safady and Craig Chapman, and GG Filmz’s Deborah Giarratana. Machine Gun Preacher will be released by Relativity Media in New York and Los Angeles on September 23rd and will expand markets in the weeks to follow. On behalf of Relativity Media, here is the Official Poster for their upcoming film “MACHINE GUN PREACHER”, starring Gerard Butler and directed by Marc Forster. In this inspirational true story, Machine Gun Preacher is about Sam Childers, a former drug-dealing criminal who undergoes an astonishing transformation and finds an unexpected calling as the savior of hundreds of kidnapped and orphaned children. Gerard Butler (300) delivers a searing performance as Childers, the impassioned founder of the Angels of East Africa rescue organization in Golden Globe-nominated director Marc Forster’s (Monster’s Ball, Finding Neverland) moving story of violence and redemption. When ex-biker-gang member Sam Childers (Butler) makes the life-changing decision to go to East Africa to help repair homes destroyed by civil war, he is outraged by the unspeakable horrors faced by the region’s vulnerable populace, especially the children. Ignoring the warnings of more experienced aide workers, Sam breaks ground for an orphanage where it’s most needed—in the middle of territory controlled by the brutal Lord’s Resistance Army (LRA), a renegade militia that forces youngsters to become soldiers before they even reach their teens. But for Sam, it is not enough to shelter the LRA’s intended victims. Determined to save as many as possible, he leads armed missions deep into enemy territory to retrieve kidnapped children, restoring peace to their lives—and eventually his own. The explosive, real-life tale of a man who has rescued over a thousand orphans from starvation, disease and enslavement, Machine Gun Preacher also stars Michelle Monaghan (Due Date), Kathy Baker (Cold Mountain), Madeline Carroll (Mr. Popper’s Penguins), Academy Award® nominated Michael Shannon (Revolutionary Road) and Souleyman Sy Savane (“Damages”).